Global objectives: In this consortium, we have mobilized a critical mass of expertise to investigate, on a Europe-wide scale, the natural history and pathophysiology of a series of rare inherited diseases affecting the kidney. The project uses and develops multiple models with the aim to develop preventive, diagnostic and therapeutic interventions. A central part is the creation of a European registry and a network of genetic laboratories to foster a tight interaction between physicians and researchers, promote clinical and basic research, and ensure the efficient dissemination of knowledge. The informations on the natural course and pathophysiology generated from patients cohorts in Topics 1 to 5 will be complemented by the creation of a European Registry and a Network of Genetic Laboratories involved in rare kidney diseases (Topic 6). 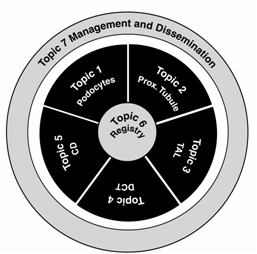 Management and dissemination (Topic 7) will support all activities within the consortium (see figure). 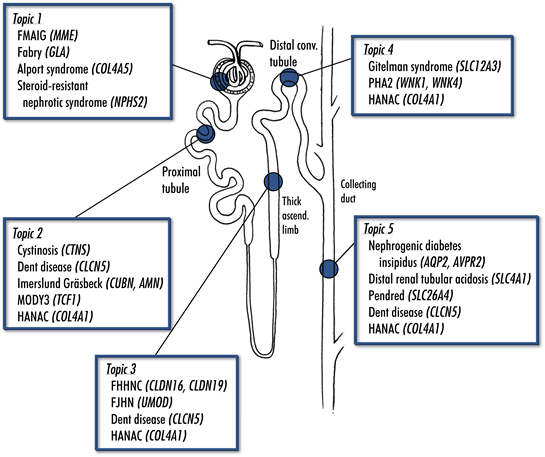 The figure below details the 16 rare inherited nephropathies that are investigated, grouped by segment/topic. These diseases are caused by mutations in 20 genes (indicated in italics) that encode proteins involved in a wide range of functions (enzyme, transport, structure, transcription, …).